Saturday, June 6, was a gorgeous day to be on trails and the FTC embraced the day with several celebration hikes. Our group of ten hiked on the Foothills Trail and the Chattooga Trail to make a loop from the Burrell’s Ford parking area visiting King Creek Falls, Spoonauger Falls, and the Winchester Cemetery. After the recent rains, the falls, creeks and rivers were flowing at a rapid pace creating a spectacular site. The weather had also created an abundance of Indian Pipe especially along the river. We enjoyed seeing the forest floor covered in New York Ferns, some Rhododendron Minus still blooming and the huge flowers on the Heart Leaf Ginger. One of the most unusual moments and a highlight of the hike was a result of two ladies who were hiking the 28.3 mile “Make a Wish Foundation Challenge.” We were gathered in a circle talking about the Mountain Magnolia when they came around a curve about half way through the Whitewater to Oconee State Park hike. These ladies asked if we were a prayer group since they needed a prayer. We all joined hands thanking God for His beautiful creation and asking for strength and safety for all the hikes. 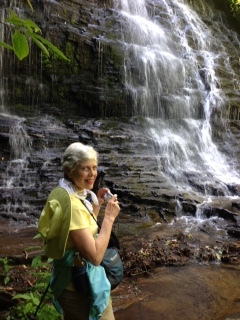 We spent a wonderful morning, with a great group, enjoying the magnificence of the Chattooga Wilderness Area.